As we look forward to a new year we also reflect on the efforts and achievements of Gosport Cats Protection’s volunteers and supporters during 2018. Throughout the year Gosport CP volunteers have worked hard promoting feline welfare and supporting owners. A total of 63 cats and kittens were rehomed by the charity after being fostered, and successful home visits conducted by volunteers. Some of the foster cats were adopted by their fosterers who decided they just couldn’t be parted from them. 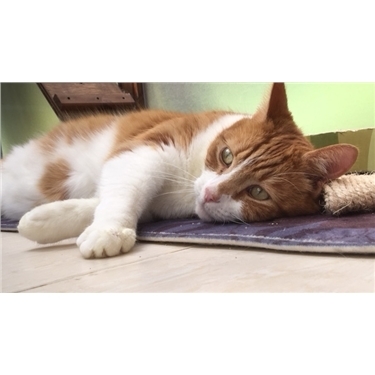 One cat was transferred to Ferndown Rehoming Centre as he was struggling in a pen and it was felt his homing prospects were better at a CP centre, and one feral cat was relocated to a farm after being neutered. Sadly we’ve had 7 cats in care whose health and welfare was seriously compromised and on vets advice were put to sleep. Some cats needed extensive vet treatment for health problems apparent before they came into CP care with dentals being high on the surgery list. Two of these, Harley and Archie, needed major surgery to extract most of their teeth and were nursed back to full health over a few months and into loving new homes. We welcomed new fosterer Heather to the team with her foster pen generously funded by the family of Ben Potter. Gosport CP looks forward to helping even more cats. There was sad news that Hazel Alexander, the founder of Gosport Town Cats Protection branch, died on 09/07/18. Hazel’s passion and commitment to cat rescue was evident over many decades and her legacy is that Gosport CP continues to make a positive difference to cats in the local area with volunteers working hard to improve the lives of cats. Gosport CP helped cat owners too with a subsidised snip & chip campaign in the summer meaning 104 owned cats are now neutered with 89 of these also being microchipped. Owners paid just £10 to invest in their pet’s health and well being. The autumn saw two feral colonies, 20 cats in total, successfully trapped, neutered and returned to sites where they will be fed and cared for the rest of their lives. Again this involved considerable time investment from wonderful volunteers. Fundraising is essential to carry out our work and thanks are due to all who volunteered and supported a variety of events throughout the year. Up to 30/11/18 an impressive £14,866.47 had been raised all to help cats. Special mention to Mollie and David, who’ve raised over £3000 from their driveway and garage sales in 2018. Thank you to everyone who’s baked, bought, donated, crafted, created and helped for the benefit of Gosport CP. The Lost & Found service is always busy and volunteer Carole is dedicated to investigating every report of missing or found cats; advertising, giving advice and scanning found cats for microchips. Carole has reunited 117 cats with their owners having received over 300 reports of lost and found cats. Some cats were sadly victims of road accidents and others were signed into CP care where no owner came forward. There are no days off in cat rescue – indeed Carole facilitated the happy reunion for cat and owner on Boxing Day, the same day the report of a found cat was made. Highs and lows for Gosport CP and we ended the year on a definite high as so many people kindly donated a Christmas shoebox of treats, toys, blankets and food for a cat in care. The appeal captured imaginations and it’s been wonderful to share the stories of foster cats enjoying their very own Christmas present with our followers and supporters. The new year began well with a trio of adoptions for Belle, Poppy & Lucky on New Year's Day 2019. Happy New Year and we look forward to your continued support in 2019.